We were driving down the highway when we felt a big bump, and saw one of our wheels rolling off into the distance. The moments that followed were surprisingly calm, considering we were screeching to a bumpy halt from full highway speeds, dragging the back left corner of the car as we went. Seemingly before we even stopped, our driver flung open his door and ran after the escaping wheel. We passengers slowly stepped out of the car. And the driver returned with the wheel, promptly setting it down and opening the trunk to reveal, not a simple jack and basic wrench, but a full size toolbox. He jacked up the car and we realized 5 bolts had sheared clean off, freeing the break drum, which was still secured to the rogue tire. The break shoe was also badly damaged where it had struck and slid on the pavement. Wrenches were employed, grease was spread, perfectly good parts on the opposite side of the car were disassembled, and 90 minutes later we climbed back into the car. 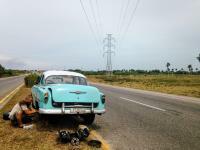 It once again had all four wheels attached, but the rogue wheel had no break, only 3 of the 5 broken bolts were replaced, and 2 of those bolts had been removed from the good side of the car, leaving both sides with only 3 of their original 5 bolts. We then drove on to our destination, though much much more slowly. 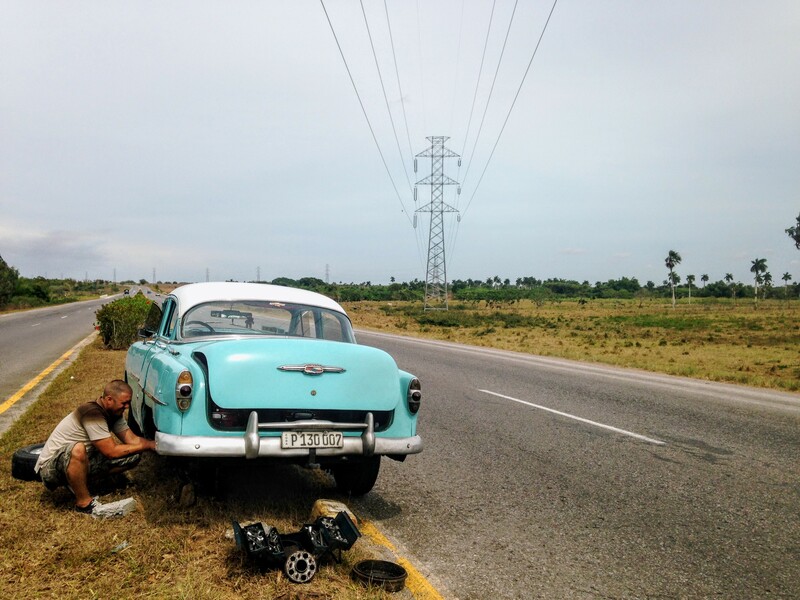 How many Cuban taxi drivers does it take to “rebuild” a drum brake in an isolated median? Apparently just one.